Twenty years ago, on 6 December, a 14-year-old youth from Resistencia, Chaco province, Argentina, suffered a serious motorcycle accident. He hovered between life and death with a brain hemorrhage. 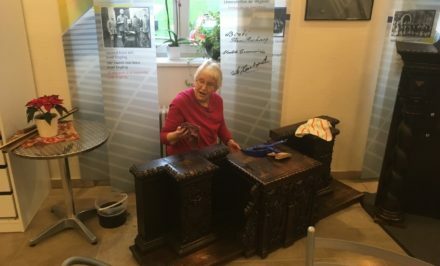 Some of his school teachers his called his mother to tell her they were praying to Mary of Schoenstatt for his complete recovery, and they showed her a Pilgrim Mother. 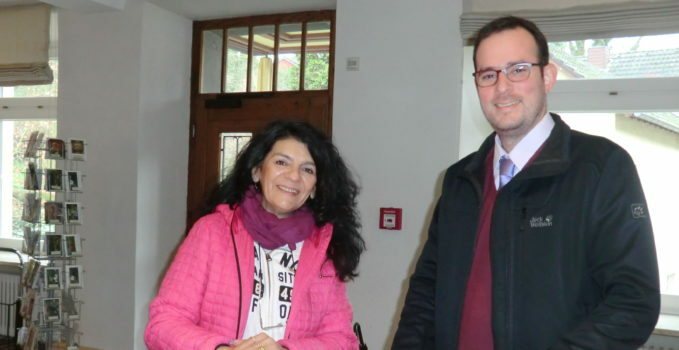 “I am finally here, twenty years and a day later, to thank Our Lady of Schoenstatt,” Marisel Juric said on the afternoon of 7 December 2017. 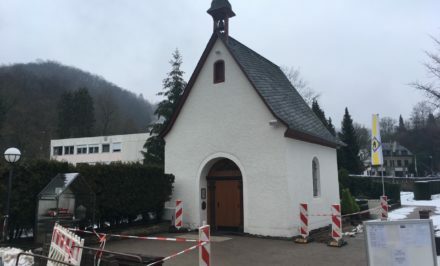 She got House Marienau confused with the entrance to the Mary’s Schoenstatt’s Shine.” Roberto González from the schoenstatt.org “Dreamteam,” who entered five minutes later, became Marisel’s guide; she only had four hours to spend on this greatly desired visit after twenty years. 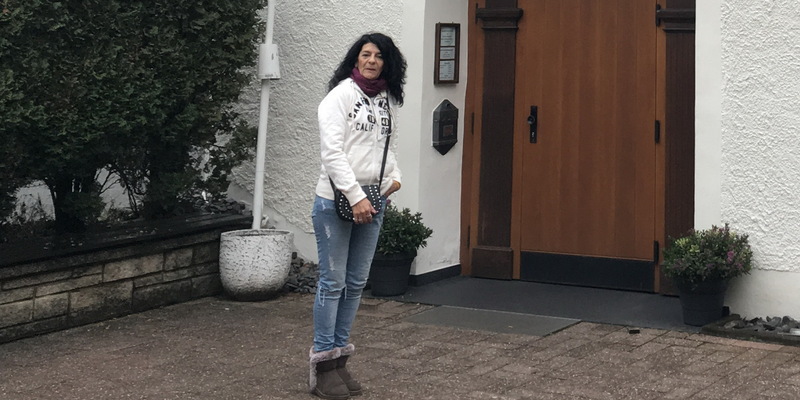 It was a welcome gift for Marisel, who stayed at a hotel in Koblenz, because she did not know that there were places to stay in Schoenstatt, but “thanks to the Schoenstatt website,” she found directions to Schoenstatt. And as always, the Blessed Mother’s gifts are pure generosity: Roberto is from Asunción, the closest shrine to Resistencia, a shrine Marisel had already visited. In an instant, a bond had been created between them. 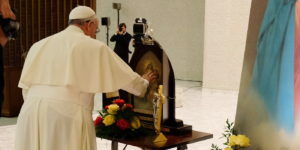 “On my trips through Argentina, I always look for Mary of Schoenstatt’s wayside shrines,” she explained. “I always find one.” She related about a trip with her husband from southern Argentina to Chile. 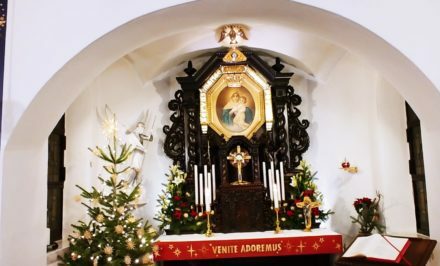 “My husband was a little nervous about customs at the border…and I saw her there, in a simple wayside shrine, which read: ‘Brotherhood Wayside Shrine Chile – Argentina’ What could happen if we were accompanied by Mary of Schoenstatt’s brotherhood of these two countries? I said to my husband. 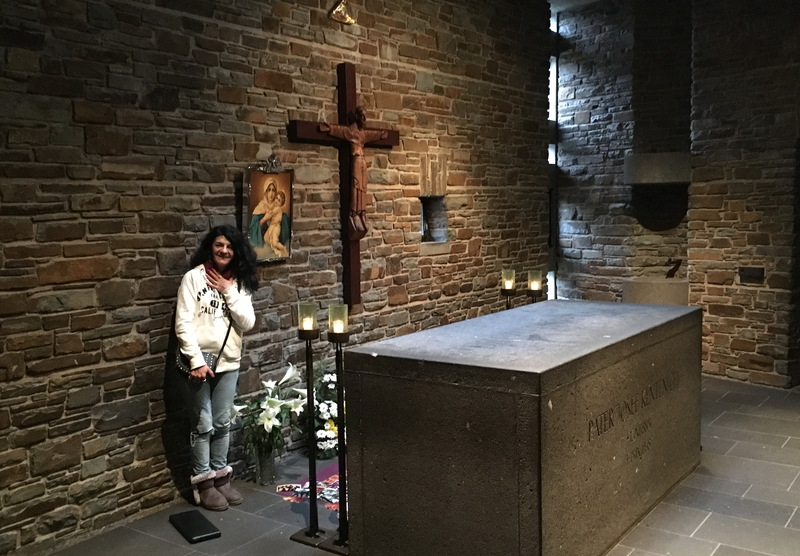 ‘She is always with us,’ like during those sorrowful days of vigil at the hospital by her son’s side were strengthened by the prayers of those missionaries. 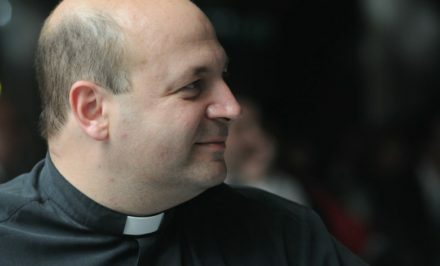 Roberto accompanied a pilgrim to the Original Shrine. It was a touching moment, strong, unforgettable. It was a moment for expressing gratitude for that miracle twenty years ago, the complete recuperation of her eldest son. A dialogue between mothers, an intimate dialogue. 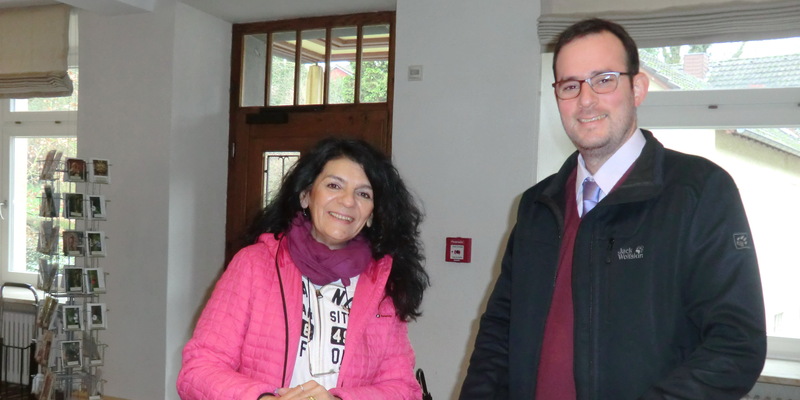 Sr. Lourdes, who the two met on the road, allowed herself to be conquered to take Marisel and Robert to Mount Schoenstatt for a fleeting visit to Fr. Kentenich’s tomb, but immediately afterwards it was time to say goodbye and catch the train to Prague. Our road of faith is united in an indissoluble way to Mary who since the moment that Jesus died on the cross, he gave her to us as Mother saying: “Behold, your mother” (Jn. 19:27). These words have the value of a testament and it gives the world a mother. 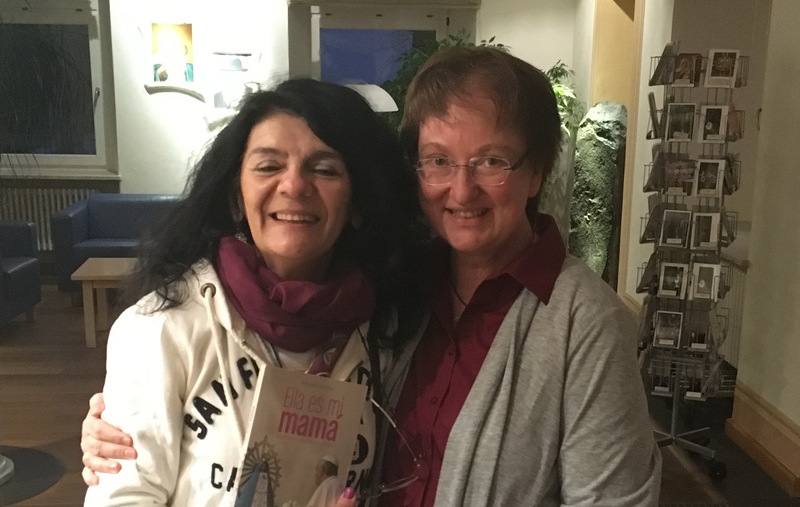 From that moment, God’s mother also became our mother. At that time, when the disciples’ faith was cracking because of the many difficulties and uncertainties, Jesus entrusted her, the first to believe, and the one whose faith never waned. Thus the “woman” became our mother at the moment she lost her divine Son. And her wounded heart broadened to take in all men/women, good and bad, everyone, and she loves them as Jesus loves them. The woman who at the wedding of Cana of Galilee had cooperated with her faith and the manifestation of God’s wonder in the world keeps the flame of faith in her Son’s resurrection, enkindled in Calvary, and she communicates it to others with maternal affection. In this way, Mary becomes the source of hope of real joy.